It’s the beginning of Funfetti Week! I am SO excited! I have been baking cakes from scratch for about a year and a half now. Prior to then, all I had ever made was a cake out of a box. 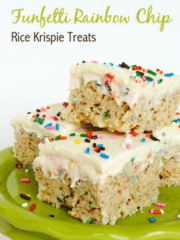 I have become a firm believer in scratch cakes, but the one box I can’t seem to shake is Funfetti. And not just Funfetti, but Funfetti with Rainbow Chip icing. I just don’t think you can have one without the other. Betty Crocker came out with a Party Chip box mix (I think it was in the past year or so, cuz that’s when I noticed it) and I tried it not too long ago. Unfortunately I threw most of it out. 🙁 It just wasn’t the same. And I don’t think you can call a vanilla cake with sprinkles in it a Funfetti cake. I think those should be called what they are – vanilla cake with sprinkles. There is a distinct taste to the original box mix. Do I sound crazy obsessive yet? I have literally eaten an entire funfetti cake with rainbow chip icing on my own in about 48 hours. Multiple times. It seriously takes all of my strength to NOT do that. I will straight up stick a spoon (or finger) into a tub of rainbow chip icing and just go to town. It’s the best part. When I moved to South Florida after college, I couldn’t find rainbow chip icing anywhere. It was a crisis. Fortunately, one of my co-workers understood and when she found it in a grocery store one day, she brought me 8 cans to work as a gift. It was the BEST GIFT EVER!! I now know that no matter where I go, Walmart has rainbow chip icing. Always. At least in my experience. I make special trips to Walmart just for this icing. 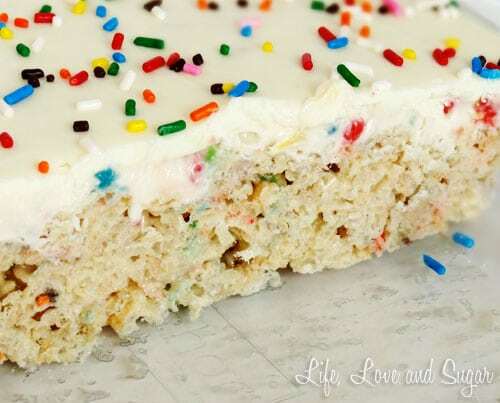 So now that I’ve revealed my crazy love of funfetti cake with rainbow chip icing, let me share with you the first recipe of the week celebrating this fabulous combo. 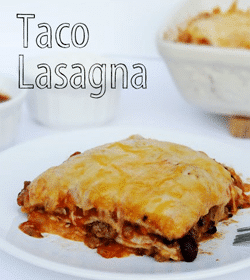 These were described by one person as the best thing I’ve ever made. I kind of hope that’s not true, because while these are awesome, it’s kind of like – really? 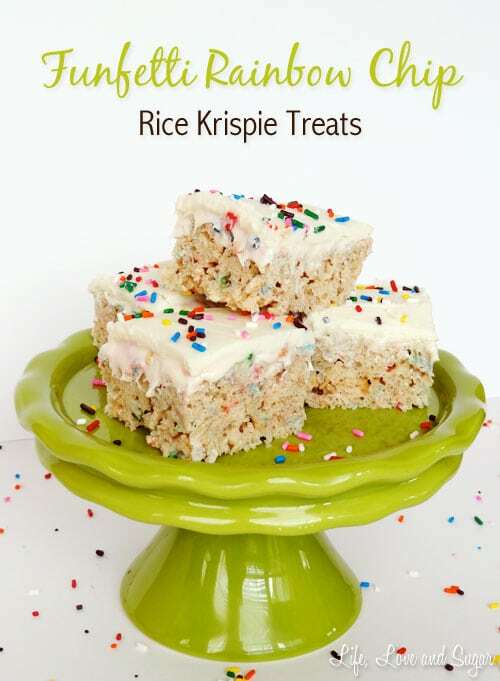 rice krispies are the best thing I’ve ever made? But whatever, I’ll take it! They ARE delicious after all. And while you could make them without the rainbow chip icing and white chocolate, to me you can’t have funfetti without rainbow chip. 1. Melt butter in a large pot over low heat. 2. Add Marshmallows and stir constantly until they are fully melted. 3. Stir in the dry cake mix and vanilla. Remove pan from heat. 4. 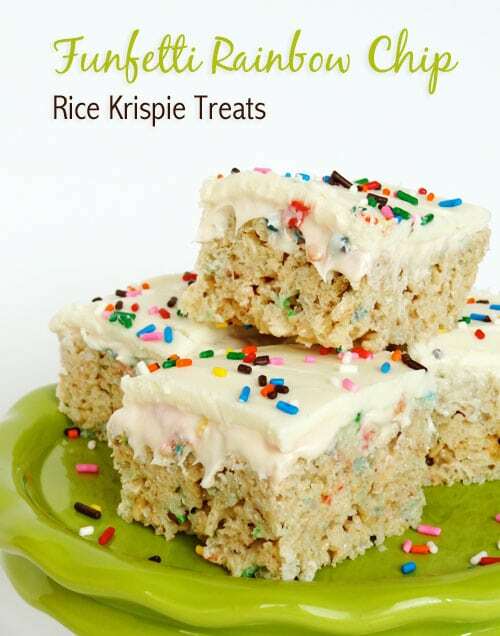 Stir in rice krispies cereal until it is completely coated in marshmallow mixture. 5. Press into a baking pan (any size is fine, I used an 11 x 7) that has been sprayed with nonstick spray. Don’t press too hard, or your treats will be hard. 7. 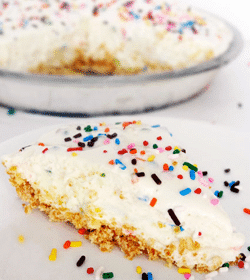 Spread on a layer of rainbow chip icing. 8. Melt down the white chocolate and spread over the icing.